At the beginning of the year, our friend OJOstudio’s Joey3d aka the Skull Puppet aka Nuttayuth Thunyaluckpak (more names than Prince, HA) showed us all the early prototype and blank version of his soft vinyl ASURA here. Pulling Thailands tradition, heritage and mythology and adding a cute twist to the ASURA. 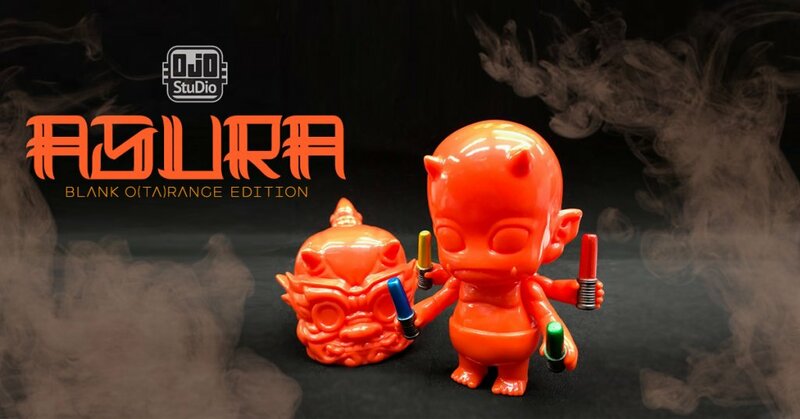 Then in March OJO Studio brought to us the fully painted version of ASURA. NOW its time for the Asura blank O(ta)range. Wait….. No milk bottles this time around but what you do get with it is microLIGHTSABERSS! HOW TO ENTER for “ASURA O(ta)range ” online sale. Subject: your name and “ASURA original colour”. Find OJO Studio on Instagram and Facebook.